Marriage life is THE BEST! Besides getting to hang out with my BFF all the time, I know live in a beautiful basement apartment that we enjoy all to ourselves. Before getting married, both of us lived in apartments with roommates. I had five, he had three. As fun as roommates are, things got pretty crowded and messy. There’s something truly magical about having a whole apartment just to ourselves. We can decorate how we want and keep it nice and clean. Not to mention our fridge space is something else. One of my favorite parts about the place is our Breville mini oven. At first, I was worried (since I’m a huge baker) about not having a full sized oven. But this oven is absolutely fantastic. It heats up super quick, doesn’t heat up the whole house, and bakes things fast. 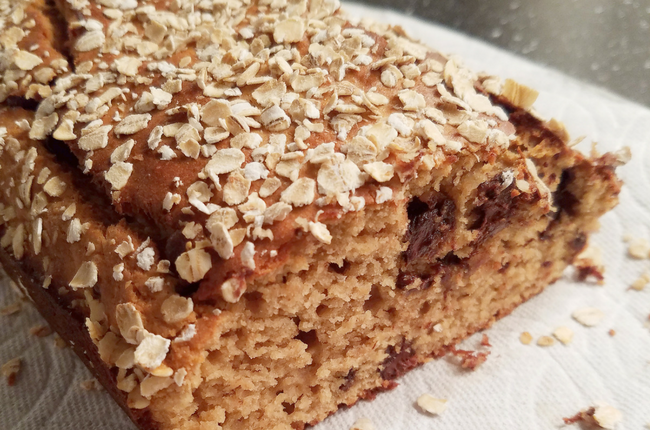 I tested out the mini oven with this healthy peanut butter banana bread and it turned out fantastic! I’ve never added peanut butter to banana bread before, but It was a nice change. It basically replaces the oil in the recipe and keeps the bread moist. I only added 1/4 c of brown sugar and the rest of the sweetness came from Organic Vanilla Protein and the bananas. It was the perfect amount of sweetness. Mash the bananas and mix with the peanut butter, eggs, and vanilla. Mix in sugar and cinnamon. Add whole wheat flour, IdealRaw Organic Protein and mix well. Top with oats if you want! *This post contains affiliate links so I can afford to make food and share the recipes with you.